Panzerkampfwagen 35S 739(f) "Beutepanzer" (War Booty Tank), a captured Somua S-35 medium tank with a 47mm (1.85 inch) main gun, probably attached ot the 25th Panzer Division during garrison duties in Norway. As the Eastern Front consumed more and more resources, inactive areas of Reichskanzler (Reichchancellor) Adolf Hitler's Greater German Empire received captured equipment from the conquests of 1939-1940. 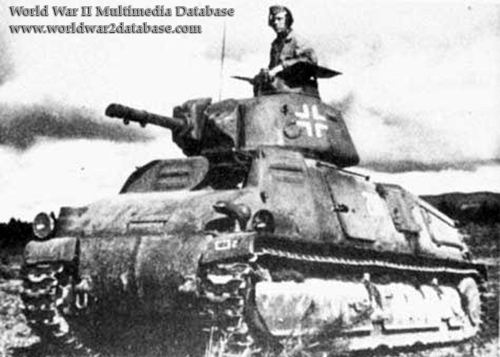 These tanks lacked the radios and equipment for successful employment with the fornt line panzer divisions. While the 25th Panzer Division was sent to the Eastern Front in 1943, the fifteen Somuas stayed behind. Sizeable, yet poorly equipped, German forces were positioned in Norway waiting for an Allied attack that never came.